Foreign direct investment into the Philippines plummeted by more than 90 per cent in the first half of this year. The troubling figure is set to overshadow government plans to dispatch an economic team to attract US businessmen to invest in the Philippines. The gloomy economic news was presented at a Senate budget hearing and cited by Senate Minority Leader Franklin Drilon. ance (DOF) is preparing to send an economic team to the US to present the administration’s “Build, Build, Build” infrastructure plan and a blueprint for tax reforms. Sen. Drilon had expressed alarm at the figures presented at a hearing last week on the budget of the National Economic and Development Authority. In a statement, he said that data from the Bangko Sentral ng Pilipinas (central bank) showed a “significant deceleration” in new investments. The entry of new investments — which is separate from money reinvested in existing businesses — went down by 90.3 per cent in the first six months of 2017. In the same period last year, $1.448 billion was invested. This year the figure stood at a derisory $141 million. This huge reduction is expected to add an element of urgency to the economic team’s mission to the USA. The DOF statement said the team, led by Finance Secretary Carlos G Dominguez, would be at the fourth overseas Philippine Economic Briefing in New York City tomorrow (Wednesday, October 11) with “a better-rounded picture on key developments in the Philippines’ fast-growing economy”. The DOF said the focus of the presentation would be on the “golden age of infrastructure” being ushered in by President Duterte’s administration. The ambitious plan calls for 75 flagship “game-changing” infrastructure projects. Half of which would be completed within the president’s term of office, which expires in 2022. Supporters of the plan hope to spend up to nine trillion pesos on the programme. 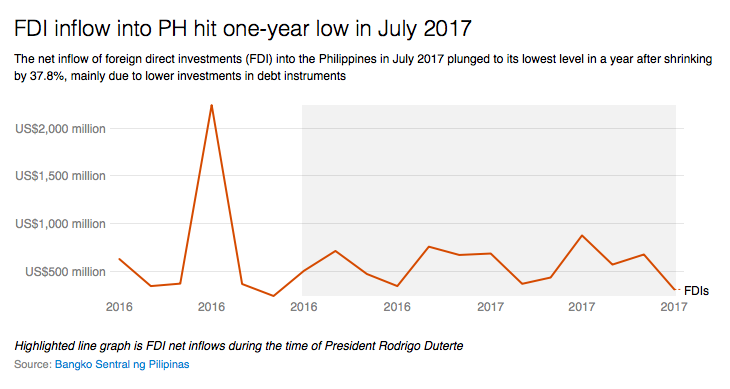 Foreign direct investments (FDI) posted US$307 million net inflows in July 2017, lower than the US$493 million net inflows recorded in the same month last year. 1, 2 This was mainly on account of the decline in investments in debt instruments to US$105 million from US$407 million, which outweighed the more than five-fold increase in net equity capital. The surge in net equity capital to US$131 million was due mainly to the increase in equity capital placements to US$170 million, which more than compensated for the withdrawals of US$39 million. Equity capital infusions in July came mostly from Singapore, the United States, the Netherlands, Japan and Taiwan. These were invested mainly in manufacturing; real estate; wholesale and retail trade; financial and insurance; and electricity, gas, steam and air conditioning supply activities. Meanwhile, reinvestment of earnings expanded by 11.5 percent to US$71 million during the month. As a result of these developments, FDI net inflows reached US$3.9 billion in the first seven months of 2017, 16.5 percent lower than the US$4.7 billion net inflows last year. Net equity capital registered lower inflows at US$272 million from US$1.5 billion last year. Equity capital placements during the period emanated mainly from Singapore, the United States, Japan, Hong Kong and the Netherlands. These were infused largely in real estate; manufacturing; financial and insurance; electricity, gas, steam and air conditioning supply; and wholesale and retail trade activities. Investment in debt instruments increased by 13.9 percent to US$3.1 billion from US$2.8 billion last year. Reinvestment of earnings also expanded by 9.3 percent to US$487 million during the period. Try this media release (the one under discussion) from yesterday, not Monday. You will see the 90% figure in the second paragraph: http://www.bsp.gov.ph/publications/media.asp?id=4502 .